There’s lots of different watch options available and that’s a good thing. But you should pick a watch brand that emphasizes quality and personality. These are some fantastic brands we’d recommend – Citizen, Seiko, TAG Heuer, Bulova, Tommy Hilfiger, Versace, Orient, Fossil, Tissot, Nixon, Vincero, and Omega. The cost of these hand selected 21 watches range from $80 to $3,500. Most of the watches are affordable and under $500. I mean you don’t want to purchase something that seems cheap or breaks within the first year of marriage. You need to buy something that will last forever. Just like your marriage. There’s several types of watch cases, including stainless steel, gold plated stainless steel, resin, plastic, and wood. Since this is a special gift for your groom on your wedding day, we suggest you stick with stainless steel or gold plated stainless steel as these types of watches are both durable and stylish. There’s lots of wood watches you’ll find on-line but in our experience these watches are fragile and require special care so they do not break. Stay with what you know and what is durable, stainless steel. Now, let’s see these great watches! The first in the list of groom watches is this Citizen’s Eco Drive Watch. It features a 42mm wide thick solid stainless steel case with a fixed bezel and textured push-pull crown with function pushers. This model is actually powered by a reliable Japanese Eco-Crive H504 chronograph movement which is fueled by light so it never needs a battery. This stylish watch also features a sharp looking blue dial with white accents silver tone luminous hands and index hour markers along with the chronograph, 12/24-hour time and date display functions, scratch resistant sapphire crystal and water resistant to 100 meters. It has a 21mm wide solid bracelet with fold over push button clasp. This brand new watch comes in an original Citizen gift box and is backed by a 5 years limited warranty. This is a very popular brand for groom watches and wedding gifts. Like it, Buy it! This Seiko Presage Watch features a 40.5mm thick stainless steel case with a leather band. It has a water resistance of 50 meters. This model has manual and automatic winding capabilities. It has a date calendar with a box shaped crystal. The watch has a 3 year limited warranty. Makes a great gift for the groom. Like it, Buy it! This TAG Heuer Watch features a rotating black bezel and and white dial with date window. It has a 41mm stainless steel case with synthetic sapphire window. The watch features a Quartz movement with analog display. This timepiece is water resistant to approximately 200 meters and suitable for marine activity and water sports. The watch has a 2 year limited-warranty. Like it, Buy it! This Seiko two-tone watch features a gold-tone bezel with a Japanese quartz movement; these groom watches offer a unique analog display. The watch has a protective Hardlex crystal dial window. It features dual time capability with date window, chronograph sub-dials, and link bracelet. The watch is water resistant up to 100 meters. Like it, Buy it! This Eco-Drive watch features an atomic clock, one-second chronograph, perpetual calendar, alarm, luminosity, and day/date functionality. The black case is 42mm. The watch has water resistance of up to 200 meters. The watches’ Eco-Drive technology use the power of light to make the watch one of the most accurate in the world. This Citizen watch features a 2 year limited warranty. Like it, Buy it! This incredible timepiece has proprietary Precisonist quartz accuracy, a very cool feature of groom watches for men who like this style. It is made of stainless steel. It has a two-tone gold ion plated case is 46.5mm in diameter and 18mm thick steel. The watch features luminous hands, date window, and is water-resistant of 300 meters. In our list of groom watches, this is ideal for men who like water-sports and swimming. There is a 2 year limited warranty on this timepiece. Like it, Buy it! This Tommy Hilfiger watch is made of stainless-steel with a leather band. The case diameter is 44mm and water resistant to 165 feet. This timepiece has quartz movement with weekday and date. The watch comes with a fantastic limited 10 year warranty, a great benefit to look for in groom watches. Like it, Buy it! This incredible watch is made with a monochromatic black color and incorporates a battery-free Eco-Drive system. The watch is powered by the sun and has quartz movement. Plus, features include water resistance to 30 meters and a 5 year warranty (limited). Makes a good looking watch for the groom. Like it, Buy it! A fusion of trend and tradition makes this Dylos timepiece from the fashion forward Versace the ultimate accessory for the modern man. The two-tone bracelet and handsome blue dial create an office-ready style that will pair perfectly with a suit and tie, while the cushion shaped case and subtle Greek key motif add a touch of style for a night out with the guys. It has a 42mm two tone case with blue dial and automatic movement. The watch is water resistant to 50 meters and comes with a 2 year warranty. Like it, Buy it! A beautiful watch that features automatic movement and sapphire crystal glass. The case size is 36mm. The watch includes both date and time. It has water resistance up to 100 meters and stainless steel. The watch includes a 2 year limited warranty. Like it, Buy it! If you’re looking for groom watches with a rugged style, you’ll find it with this industrial Machine of a watch from Fossil! Blue ion-plated bracelet with fold-over, double push-button release. Round face. Three-hand analog display with quartz movement. Dial features silver-tone hands, date display window, minute track, and Fossil detailing. Display case included. Case Height: 42 mm Case Width: 42 mm Case Depth: 11 mm. The watch comes with a 2 year limited warranty. Like it, Buy it! Marvel at the inner workings of this dual aperture dial self winding mechanical from the BVA Series, featuring clear exhibition case-back. The 21 jewel self winding movement means battery-free operation and provides for years of reliable service. The warm brown dial includes a wealth of details including roman numerals, minute track and 2 sub dials. Its stainless-steel case and leather construction provides hypo-allergenic and durable build quality from Bulova. The watch has a brown pattern with rose gold dial. IT has a lovely leather strap and is water resistant to 30 meters. The case diameter is 42 mm and 11.2 thick. The watch comes with a 3 year limited warranty. Like it, Buy it! The unique groom watches from Tissot feature a stainless steel case, bracelet, and bezel. There is a silver dial with silver-tone hands and index hour markers. Tachymeter around the outer rim. Dial Type: Analog. Luminescent hands and markers. Date display at the 3 o’clock position. Chronograph – three sub-dials displaying: 60 second, 30 minute and 6 hour. Automatic movement with a 45-hour power reserve. Scratch resistant sapphire crystal. Screw down crown. Solid case back. Case size: 42 mm. Case thickness: 14.8 mm. Round case shape. Band width: 20 mm. Band length: 9 inches. Fold over clasp. Water resistance of 100 meters / 330 feet. Functions: chronograph, tachymeter, date, hour, minute, second. Casual watch style. Watch label: Swiss Made. Watch comes with a 2 year warranty. Like it, Buy it! This beautiful crafted rose-gold watch is magnificent and made of stainless steel. The watch has a double-curved K-1 mineral glass box crystal blue sun-ray dial, luminous hands, and calendar. In addition, you’ll enjoy a genuine leather strap and water resistance to 30 meters. Like it, Buy it! What an incredible watch! This TAG Heuer watch has a 43mm case with a fixed bezel and black ceramic top ring showing tachymeter markings. The watch has Swiss-quartz movement and is water-resistant to 200 meters. A 2 year limited warranty is included. Great groom watch. Like it, Buy it! The Nixon 51-30 is a chronograph, all gold watch. This watch has the crown positioned at 9 and pushers at 8 and 10 to prevent “wrist bite.” Date window and 24-hour and seconds subdials for superior capability. Water resistant up to 300 m. Imported. Measurements: Case Height: 51 mm Case Width: 51 mm Case Depth: 16 mm Band Width: 25 mm Band Circumference/Length: 10 in Weight: 10.2 oz Like it, Buy it! The name says it all, yet there’s so much perfection in being minimalist. This great looking watch will present well on any man’s wrist. It’s cost effective. The watch has a brown leather band and offers water resistance up to 165 feet. It’s durable and a great buy for groom watches or for anyone you know. Like it, Buy it! This fantastic watch has an Italian leather band. This timepiece is black and gold but come in multiple color options. You’ll see those by clicking the other watch colors. The Kairos wrist watch is also scratch and water resistant. Like it, Buy it! There’s a lot to love with this Citizen Men’s Eco-Drive watch, definitely one of the top picks in this groom watches list. The rose gold tone looks great. The watch’s eco-drive means it’s powered by the light. The leather band is made from genuine calfskin. It’s also water resistant to 330 feet. The watch has sub-dials that tell day and date. Like it, Buy it! By now you’ve realized I like these Eco-Drive watches by Citizen. 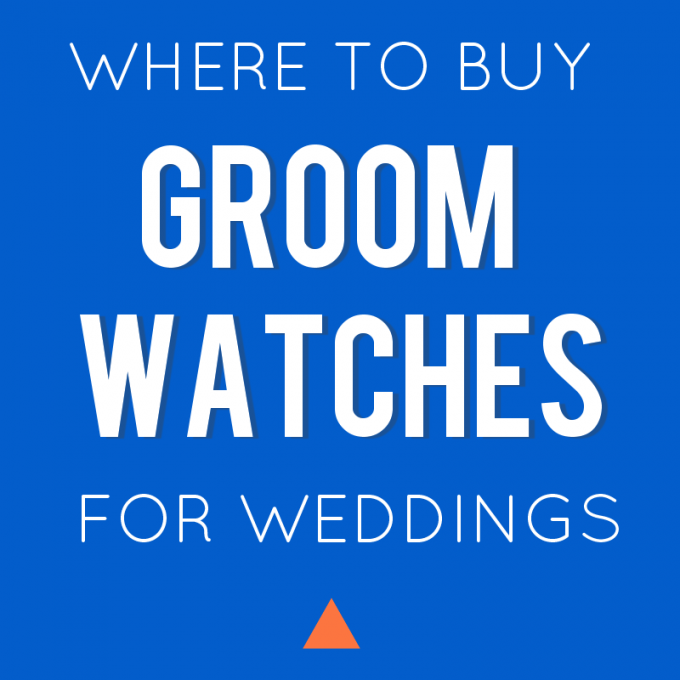 They look great and there’s more than 3 on this list of groom watches. The coolest thing about this model is it’s ability to tell world time. Want to know the time in London, Paris, Athens, or Tokyo? This watch will tell you! That’s awesome! On top of that feature it’s powered by light, has luminous hands and markers, water resistant to 330 feet, and is multi-functional. If your groom doesn’t like it, I will. Like it, Buy it! The Omega Speedmaster makes a legendary groom watch. An exciting part of this watch model’s history is it’s part of all six lunar missions. It was the first watch worn on the moon. This is the only one of the groom watches on this list with a manual winding mechanism. It’s Swiss made and offers 165 feet of water resistance. The sale price on Amazon right now is discounted from Omega’s website and a great deal for those wanting an Omega watch. Like it, Buy it! This is another beautiful Omega watch. This model features a black dial with Roman numerical indices and an enlarged date window. The watch is made in Switzerland and has a leather crocodile band. It has up to 99 feet water resistance and is also scratch resistant. Like it, Buy it! I hope you found your perfect groom watch. Feel free to comment and tell us how he liked it! Keep an eye out for a future post for guys looking to purchase a watch for the bride. You can also check out these gifts for the bride from the groom.